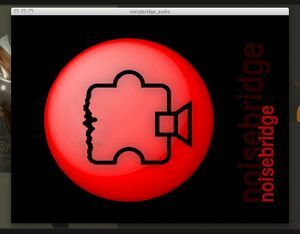 File under Someone Had To Do It: Noisebridge logo done in processing (zip file). Requires the minim audio libraries to function correctly. Still needs some work. Looks way better in motion, video forthcoming when I find a good free video capture util for mac. By Steen. Share and Enjoy! Update: Here is a zip file with windows, mac, and linux executables. If people could let me know whether it works on their machines (specifically if the audio reactivity actually functions), I'd appreciate it. 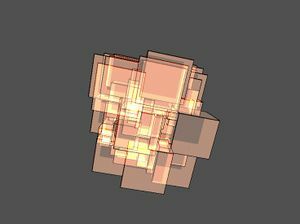 GrowCubes processing sketch(zip file). There are cubes. They grow. This was originally the example that Scott walked me through as a lesson in Object-Oriented programming in processing, so has a pretty easy-to-understand implementation of that (thanks, Scott!). Also includes an example of implementing GL blend modes (which, according to processing.org is not officially supported and may well break in future versions etc but which looks really cool in the meantime). Written by Steen, grow idea and algorithm from ioerror. Little Dudes processing sketch Little Robot Dudes. They walk. They're robots. The only complex part of this sketch is all of the positioning necessary to model them. Pictures here!